The thrilling conclusion of the Giantslayer Adventure Path! Emerging from a fire giant dungeon into a volcano's caldera, the heroes spy the Storm Tyrant's stolen cloud castle floating high above. From there, they must storm the stronghold as it takes off into the sky, engaging in bloody battle with the ruthless storm giant's elite guardians and allies. Finally, the heroes must face the Storm Tyrant himself - alongside his dominated red dragon - to put an end to his megalomaniacal push for power. Will the heroes defeat Volstus the Storm Tyrant, or will all of Avistan bend its knee to the mighty warlord and his giant armies? 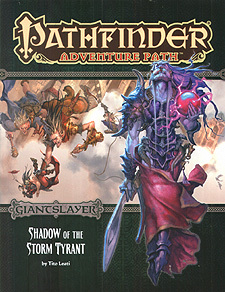 "Shadow of the Storm Tyrant," a Pathfinder Adventure for 5th-level characters, by Tito Leati. High-stakes plots and dangerous foes to continue and expand your Giantslayer campaign, by Jim Groves. A look at the extraplanar giants known as gigas, by Patrick Renie. A final tall tale of hunting giants in the Pathfinder's Journal by Patrick Renie. Four new monstrous threats, by Benjamin Bruck, Steven T Helt, Mikko Kallio, and Patrick Renie.